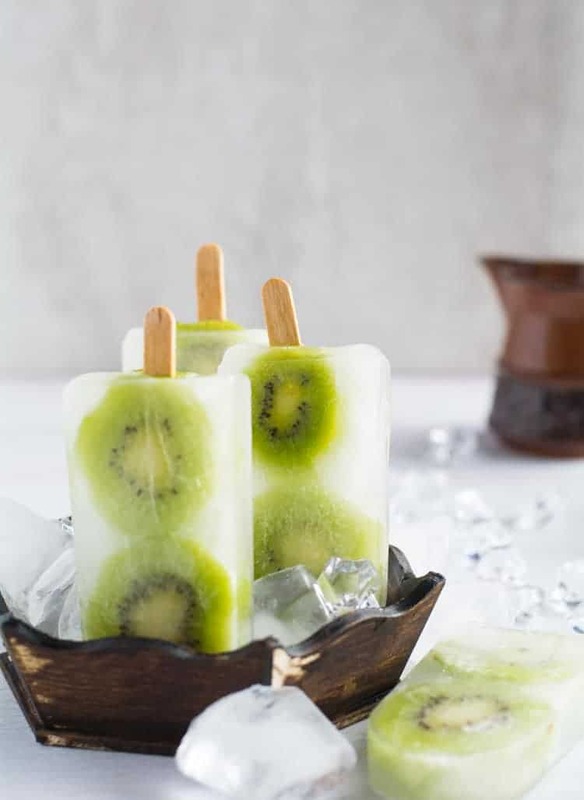 Kiwi Popsicle with Lemonade is great healthy tropical breaks and the preparation is very simple which takes just a few minutes, just fill in the mold with lemonade and kiwi slices. The outcome looks tempting and would be loved by everyone. 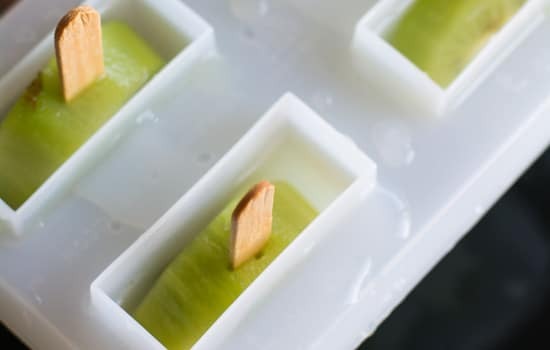 Kiwi Popsicle with Lemonade need no fancy mold, you can use glasses, small teacups, and even disposable eco-friendly teacups as molds. The taste of Kiwi and lemonade makes it perfect to be made of the popsicle. It looks amusing, enjoying the slice of fruit is entertaining, like unearthing a treasure. It is a fun way to make the children eat fruits. I prefer to have kiwi slices as whole instead of making it to puree, as it not only looks gorgeous but also every bite of fresh fruit makes it more delicious. 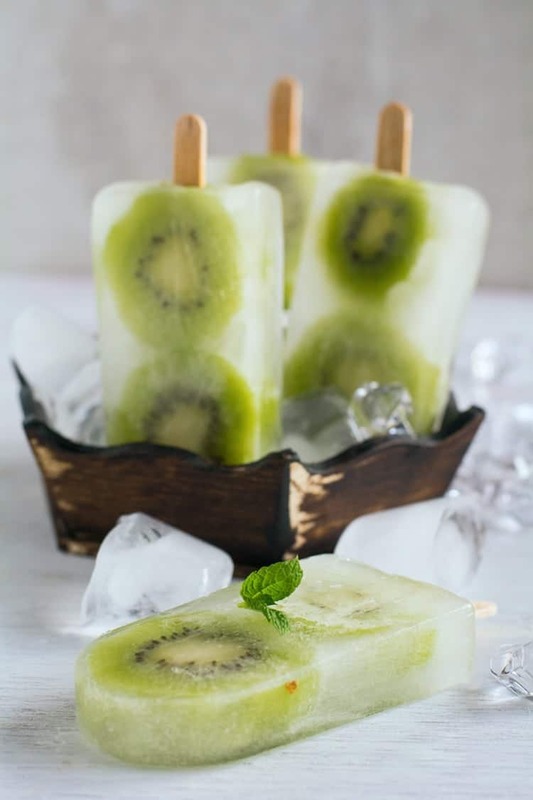 Kiwi Popsicle with Lemonade does not have a strict recipe, you may use any combo. Like, You may use orange juice, pineapple juice or mango juice, or mango Lassi. I did not add much sugar in the lemonade, but you may add if you prefer or natural sweeteners like honey. You may use any molds of your choice. If you are bored with your regular popsicle mold, try freezer friendly tea cups, small cups or bowls. You may also puree kiwi instead of slices. For inserting popsicle sticks into the popsicle molds, insert it after freezing it for an hour. If sticks are blunt, use knife make a slit gently on the fruit. 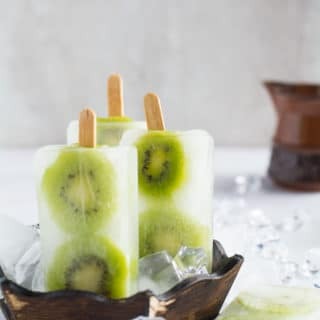 Kiwi Popsicle with Lemonade great for summer. A cool and healthy treat for kids. Made with the kiwi fruit and fresh lemon. A simple and easy recipe to make in Popsicle molds. Squeeze lemon into the water, add sweetener and salt. Taste and adjust salt and sweetener according to your preference. Peel and cut kiwi into half an inch thickness or as per the size of the molds. Arrange the slices one above the other. Add lemonade upto 3/4th of the molds. Freeze it for about 1 hour, insert popsicle sticks. Again freeze it for about 3-4 hours until it solidifies completely.